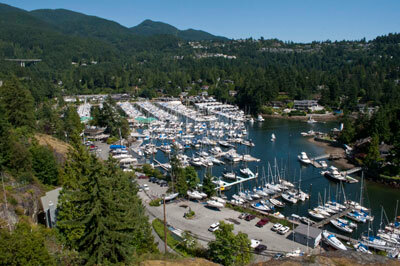 A view from a lookout along the Seaview Walk of Fisherman's Cove and Thunderbird Marina. Numerous moored boats can be seen along with a highway overpass in the left side of the photograph. Taken July 2012 using a Nikon D90 at 240dpi. Alternate Versions: Lossless TIF from original at 240dpi. Colour digital file.